Wow. Hope these authors get lots of love in return for going through this. There’s been a whole lot of commentary this week (if you don’t know that, then I salute you for finding the best hiding place in the world). One of the oft repeated words in this communal diatribe has been variations of the word “unity”: we need to unite, to unify, to come together. This word means different things to different people, a truth made clear by the discussion, but still, unity isn’t a bad idea. About ten years ago, my daughter and I sat down to watch a Billy Connelly movie. It was about a man who sued God for a natural disaster (I think that might have been the name of it too). The movie was passably good, nothing to get too excited about. But there was one scene we kept replaying over and over again because it made us laugh till we cried. It was a silly, pratfall scene with Billy in a restaurant, but each time we watched it, we thought it more hilarious than the last. My daughter was going through a difficult pregnancy and a hard time all around. We really didn’t have much to laugh about. I realized then how much we need laughter during the hardest times of our lives. There are so many things in this crazy world to be stressed about. We worry not only about the future, but the present as well. Many of us are angry, and rightfully so. Many of us are scared, and rightfully so. A good laugh could help all of us. The other movie I keep thinking of these days is the scene in one of the Harry Potter films, where Lupin teaches the students to look at their greatest fears and use the “Ridikulous” spell. What they fear is reduced to something silly and not so frightening. I look around me and see a whole lot of Ridikulous things today. Maybe I need to brush up on that spell. I’m back!!! Time and life had me going there for a while, but the new year, and my vision for it, brought me back. There’s enough ego in me to feel I have some things to say to the state of the world. Hopefully, most of them will make you laugh. Or feel a bit proud of us. I’ve thought a lot about what to wish for this year. There’s no lack of things to make me worry, or get angry. The problem is those don’t feed my soul. Give me something to laugh about. Or a reason to think “thank God, somebody was paying attention in science class.” Once we were innovators, problem solvers, people who found the humor, and the joy in life. Let’s see if we can get back to that in 2017, okay? P.S. The tree in the background fits my new path. It’s like a giant eyeball, sort of like 2017 is watching you! Posted on January 2, 2017 Categories Uncategorized10 Comments on It’s a New Year!!! 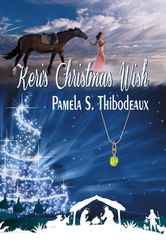 who’s here to talk about about herself and her release Keri’s Christmas Wish. Posted on December 5, 2016 Categories UncategorizedLeave a comment on Welcome Pamela S. Thibodeaux!